New boss Kenny Jackett will hold fire before deciding whether he needs extra coaching staff at Rotherham United. The 54-year-old, whose side were unlucky to lose 1-0 at home to Reading in his first match in charge last Saturday, has already brought in Joe Gallen as his number two. But the former Wolves manager is in no rush to make more additions. “The backroom staff, the likes of Paul Warne (fitness coach) and Andy Dibble (goalkeeping coach), I imagine would stay the same,” he said. “My first impressions of them are that they are good at their job. They are committed to the club. I don’t anticipate any problems. The club are interviewing for a new head of recruitment and Jackett will play a part in that process. Centre-half Richard Wood, who put in a man-of-the-match display after being recalled to the side by the new man, is anticipating a tough week in training as Jackett sets about closing the eight-point gap between the Championship’s bottom club and safety. 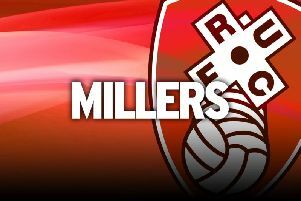 Rotherham have shipped more goals, 33, than any team in the Football League, although there was a marked defensive improvement against the Royals. “There will be a lot of hard work next week. We need to stop conceding goals. We’ve conceded far too many this season,” Wood said. “I’m expecting us to be working, working , working all week and nailing everything down. Jackett was given a rousing reception at New York Stadium and waved to supporters who were frustrated by previous manager Alan Stubbs’ failure to publicly appreciate them. “Acknowledging fans is a big thing,” Jackett said. “I appreciate the way the fans get behind us. Fans will react off what they see on the pitch and that is my responsibility as a manager in modern-day football.